Sister Aishah's Islamic Journey: Bringing Awareness to Hunger - YOU can help! (Washington, D.C. - June 5, 2006) In recognition of National Hunger Awareness Day 2006, a National Hunger Symposium was held on Monday, June 5, at the National Press Club in Washington, D.C. A coalition of organizations in the anti-hunger community, agriculture sector, federal government, conservation groups, the food industry and the faith community came together on the eve of National Hunger Awareness Day to address the growing number of hungry Americans and chart a course for change for 2006. People invited to participate in the Symposium, engaged in an expert panel discussion with topics ranging from the role of faith-based organizations on ending hunger to the Farm Bill as a federal tool to address hunger issues. 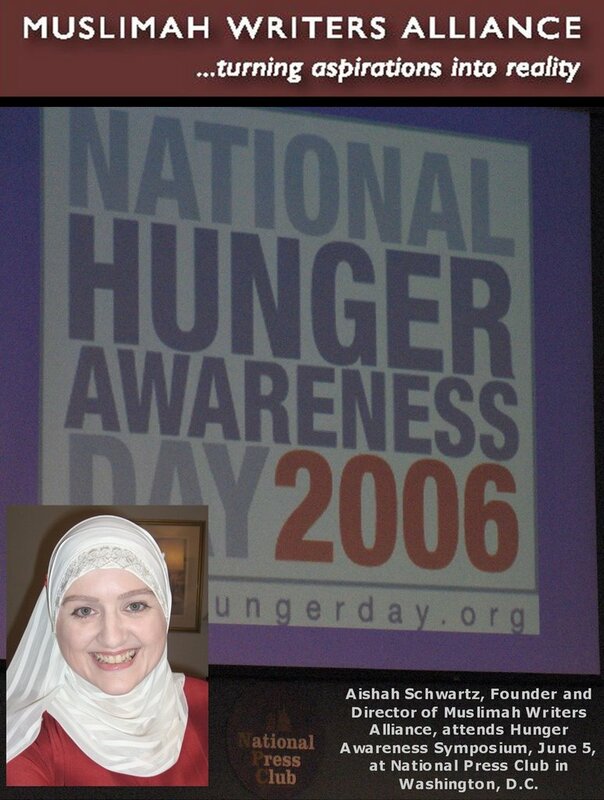 Aishah Schwartz, Founder & Director of Muslimah Writers Alliance, attended this year's symposium and presented for distribution MWA's Special Edition Newsletter offering selected essays bringing awareness to world hunger written by MWA members from Kenya, Florida, and Saudi Arabia. Established in 2006, MWA is an internationally based organization with a mission to inspire Muslim women to collaborate with one another for the sake of Allah subhanahu wa ta'ala and the common good of the Muslim Ummah, in addition to being of support to one another in fulfilling their aspirations to become established writers. Applying Islamic principles, boundless enthusiasm, experience, and resourcefulness to every project embraced, MWA members are dedicated to one another's success. Check here for additional information on how you or your organization can still get involved in the effort to end hunger, insha'Allah. SEE ALSO: The United Nations World Food Programme (WFP) honours its first Saudi special ambassador Abdulaziz Arrukban, the first Saudi citizen to have volunteered to work with the agency to raise awareness about hunger issues and funds to help alleviate it. CLICK HERE Copyright © 2006 Aishah Schwartz Permission is granted to circulate among private individuals and groups, to post on Internet sites and to publish in full text and subject title in not-for-profit publications. Contact author for all other rights, which are reserved. Mashallah you have a nice blog here. Please take a look at my blog and link it up here if you think it of benefit.